A beautiful, almost perfect day for racing. Warm, a Good 3 track, not too crowded, despite all the free tickets and all the good horses on show. I’m pretty much resigned to not being able to back Sepoy or More Joyous since I’m a place punter and $1.04 is a little bit short. 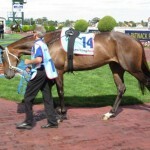 In the Futurity More Joyous looks as close to perfection in a horse as I’ve seen and I declare her to be a sure thing. 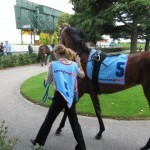 But Who-be, who looked stunning out the back with matching strapper, pushes the mare to the line. There’s a tremendous roar for Who-be when he looks likely to overhaul her, but enormous relief for odds-on punters when he just falls short. 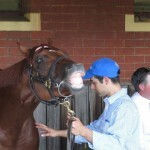 In the Diamond Sepoy just looks a class above them. Out the back he was showing me some lip with the flehmen display, a minor cause for concern, and he was slightly more unsettled in the yard than the last two times, flicking his ears and changing his stride. But he’s simply too good. In the St George I was interested to watch the performance of Rebel Soldier, who has a reputation for an evil temperament, but today is as quiet as a lamb. 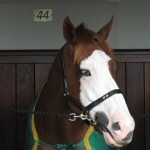 I love his Trigger good looks, with the stallion chain and hint of a white eye a reminder to be careful! The horse finished tailed off last. Only two bets for the day. 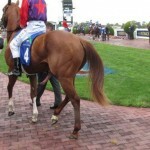 Sayahailmary pinched a break and never looked likely to miss the place at $3.00, but I gave some back on Mont Fleuri. 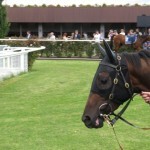 The horse did nothing in the last, even though it was a race for mares, my favourite class of race. I hate going home on a loser, especially when it has been such a good day. Climate change has a lot to answer for. Melbourne is so tropical now, hot and humid, with thunderstorms in the afternoon. It feels as if the whole town has moved 1000 km north. 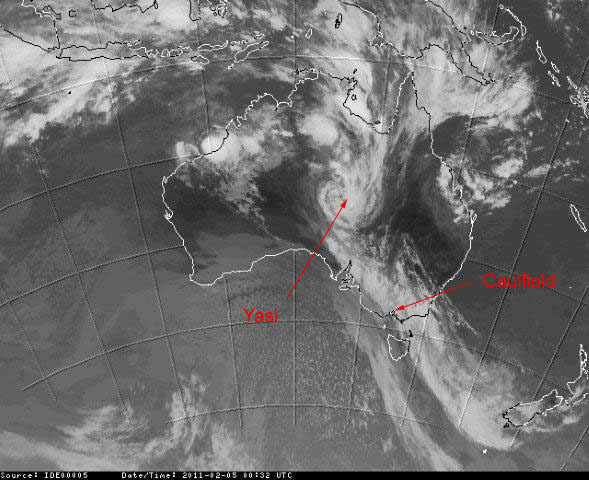 I’m still feeling tentative, and the forecast for 50 mm of rain overnight is not encouraging. I don’t know how much Flemington copped, but it’s very squelchy underfoot down at the parade ring and the rubbish bin for my lunch scraps is half full of water. It doesn’t inspire much confidence. Mister Milton’s flowerpot doesn’t inspire much confidence either. I enquire as to whether he’s a biter, but it seems he doesn’t bite strappers and prefers to nibble on himself. Maybe that’s why he’s 150/1? Compare him with The Cat. Now, there’s a fine head! The times for the first few races aren’t too bad and vary from Slow to Good until I eventually decide that the track is probably a genuine Dead. Probably bettable. The Lightning Stakes is an interesting race. Hay List looks physically impressive and the leg wound that I tried to photograph in the spring looks to have healed up OK. 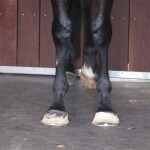 Apparently he jumped into a water trough and lifted a flap of skin on his off foreleg. The mare Black Caviar looks well, with some improvement to come, and Warm Love, who I’ve backed twice recently, looks very smart in those spiffy ear muffs. 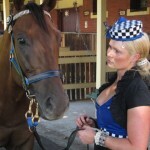 My selections are Hay List to beat Black Caviar and Warm Love. The mare is a bit short at $1.00 for the place so the question is who to back for second – Hay List at $1.50 or Warm Love at $7.30? With minus 30 seconds to go, while they are still mucking around with King Pulse, I go for Hay List. 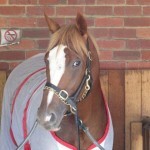 The mare wins by a street from Hay List, with another street to a dogged Warm Love. At least Hay List payed more for the place than the mare for the win, but I’m very disappointed that the dividend is chopped to $1.40. I’m even more disappointed when checking the TAB website to find the dividend declared as $1.50 and I was payed at $1.40! Not much other action to report. I backed a loser (Goldstone) and a winner (Rubinacci) for the sake of exercising my money. When will it stop raining? I need to speak to Al Gore. 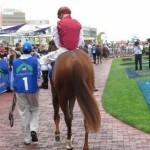 I’m feeling a bit tentative, what with five or six inches of rain at Caulfield over the week. The track is a Dead 4 with a cold southerly breeze and I watch the first couple to check the times. They seem to indicate a genuine Dead, although it probably pays not to get too far back. I’m looking forward to the two-year-olds to follow up on Sepoy from Australia Day, but the $1.04 for the place is asking a bit much. The horse won well. 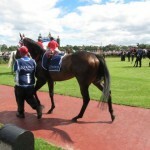 Running Tall did a good job for second, despite carting a fifth leg around the mounting yard, even with the jockey up. I’ve always thought an erection was a serious negative in two-year-old colts, but quite a few of them seem to be confounding me lately. I did my money on Eramor in the fifth, which was racing well near the lead but burnt out in the straight. And so to the sixth race. 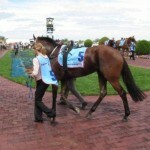 I’m watching the favourite Zelsnitz in the parade ring. 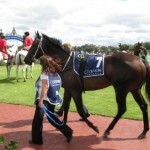 The horse is unsettled, changing stride and tossing its head around. 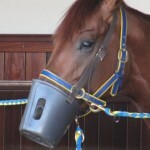 The strapper uses two hands to control it. A possible laying opportunity. A quick check on Betfair. $1.68 the place. 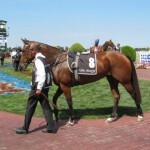 In the mounting yard they have called in the reinforcements, a second strapper. And hey, what’s that. The filly has broken out in a serious sweat. A no-no when it’s cold. I whip out the iPhone and offer $1.56 the place. The bet is matched! Normally I wouldn’t lay a horse until one minute before the off, and here it is, what, ten minutes till the jump? And normally I watch the races in the bar, but for this one I ascend the stand. Zelsnitz jumps to the lead but collapses in the run home for a flagging fifth. I’m feeling a bit cocky. It’s my third successful lay over the last few weeks. The field for the Orr Stakes is outstanding, but no bets. The champion wins well, but I’ve never really been a fan. She doesn’t carry her head like a champion, always twisting her neck and with her head down. I feel like yelling out “Posture”. In the last I like Das Machen. The horse seems to be headed near the line, but holds on for third at $3.40. Not a bad day.